Purpose and necessity of additives | Eurol B.V. The environment reigns and manufacturers have to apply the craziest tricks to allow cars to comply with emission standards. This often leads to contamination of the oil, fuel and cooling system and can even result in costly damage to the engine. Eurol anticipates this and offers a programme of additives to thwart costly repairs. EGR (Exhaust Gas Recirculation) and catalysts are now commonplace. During the eighties (in)direct injection took over the role of carburettors in petrol engines, however, this did not solely result in a more positive effect. Injection systems now also appear to be more sensitive to pollution as the nozzle holes are smaller, especially when they are located in a hot combustion chamber. The inferior quality of the current fuel exacerbates this. We must take into account an accelerated ageing of petrol and thereby prevent the formation of carbon deposits in fuel pumps, ducts and injectors, which creates blockages. Direct injection reigns in the world of diesel through a common-rail technology with high injection pressures and the application of fast-switching solenoid injectors or even piezoelectric injectors that can inject multiple times per combustion stroke. Again we can see EGR here, plus the familiar particulate filter. Just as in petrol, diesel contains an ever higher percentage of bio components, which cause an early contamination of the fuel system and the engine. A diesel particulate filter can only function properly if it can regenerate promptly, which is not always the case if the driver makes a lot of short trips. Blockages and a soot clogged EGR valve then lie in waiting. Oil consumption does not help the latter, because then the valve collects oil particles from the combustion chambers. Although much better lubricants are now sold than in the past, they are often combined with longer maintenance intervals, which cause the early ‘wear and tear’ of the oil and saturation of dirt-absorbing dopes. Dirt deposits and formation of carbon deposits may lead to turbo damage and jammed hydraulic tappets. It seems evident that the above mentioned symptoms will possibly lead to more expensive repairs if you want to keep driving smoothly as a motorist. Nevertheless, it is worthwhile to first look at affordable alternatives, meaning additives, products that you add to the engine fluids to cure or prevent such evils showing up. The R&D department of Eurol has succeeded in developing additives that reduce existing pollution and eliminate deposits, adhesions and leaks. Furthermore, the effects are also preventive. Our flushes do not contain any solvents, ensuring that the lubricating properties are maintained. The fuel additives are further free from high concentrations of aromatics, preventing the damage of seals. In a polluted petrol system a poor fuel atomisation and a false injector image of the injector nozzles will lead to incomplete combustion, which results in higher fuel consumption and, depending on the emissions, to power loss. The car owner can fix this by adding a special cleaning agent, such as the Eurol Petrol Injection Cleaner or Eurol Petrol System Cleaner, when filling the petrol tank. These products will clean the injectors, the fuel system, the combustion chamber and the EGR; for the latter there is also a separate EGR cleaner. Eurol Petrol Power is a petrol enhancer that lifts the fuel to a higher quality level. For diesel systems there are also cleaning agents to clean a fuel system with injectors (blocked and damaged by soot) such as Eurol Diesel Injection Cleaner and Eurol Diesel System Cleaner, which also work preventively. Specific problems occur in particulate filters, which must regenerate every now and then to allow combustion of the collected particles. This process requires a high exhaust temperature, which is often not achieved if the car is mostly used on short trips. A DPF cleaner can reduce the combustion temperature from 600 to 400 degrees, so that regeneration can occur earlier. Engine oil already contains important additives, such as agents to remove dirt effectively. In older engines pollution can arise from several causes, but even newer engines appear to be sensitive. Moreover, many drivers make short trips, so the dopes in the oil don’t get an opportunity to work effectively, leading to carbon deposits in highly stressed parts (piston rings, turbo bearings). Dirt particles just stick to colder parts, such as oil ducts. In time this will cause damage to a turbocharger, black sludge and oil consumption; the latter by carbon deposits on the piston rings. EGR and particulate filters will become rather polluted. In order to tackle the problem at the source, it is recommended to rinse the engine with a product like Eurol Engine Flush, followed by changing the oil and oil filter. This revives the piston rings, the oil inlet and oil outlet to the turbo and the hydraulic tappets. Cured seals, for example oil seals, will on the longer term lead to oil leakage. They can be made flexible again with a product such as Eurol Engine Stop Leak. There are also additives to increase the viscosity of the lubricant at high temperatures or to enhance the lubricating film. 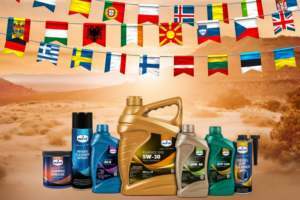 You can also buy products to clean a manual or automatic gearbox, make or keep them free of leakage and to boost the performance of the oil. Todays demands on the cooling system are high due to a combination of high heat generation in modern engines and limited installation space, hence less capacity. Consequently the cooling system deserves special attention, such as a timely replacement of the coolant, usually every two years, according to factory standards. Just as oil, coolant contains perishable additives, such as anti-corrosion dopes. This eventually leads to a lot of deposits and therefore a reduced efficiency of the cooling system. A product such as Eurol Radiator Cleaner then provides a cleansing effect. Small leaks can be solved by, for example, Eurol Radiator Sealer. All told, there are quite a few additives that can prevent or fix problems under the hood. Our on-line advisor at eurol.com/es/asesor-de-aditivos is a reliable consultant on these additives. The additives advisor translates problems into the best solutions, associated with appropriate product advice. Eurol introduces Elance 5W-30, a fully synthetic, long-life engine oil for petrol and diesel engines that complies with the new Renault RN17 standard, API SN, and the ACEA C2 and C3 classifications. Eurol is delighted to introduce the Eurol Protence 5W-30 GN II. This oil meets the GM Dexos 1 generation II specification and offers extra protection against LSPI (low speed pre-ignition) which is a serious problem for car manufacturers. Eurol uses standard cookies to optimize your experience while visiting this website.